Working with children and adults on the autism spectrum for over 19 years, I have noticed a trend in the learning style of many of my students. They often do best with academic tasks that incorporate visual structure, have a clear beginning and ending, and have a reduced amount of visual clutter. Research supports the theory that building visual structure into tasks is an effective approach to addressing the unique learning styles of students with autism. To read more about this research see Learning Through Seeing and Doing-Visual Supports for Children with Autism. I found some colored sticks in the classroom and some colored bowls. I took a few sticks and demonstrated sorting them into the matching colored bowls. Right away, this student picked up on what was needed to complete the task. He independently sorted the rest of the sticks. I started applying this concept to teach him and other students who were struggling to participate in some of the typical classroom activities. I started making a ton of materials from my office in the school. I had access to a laminator so I laminated the tasks, to keep the activities in tact. No words were needed to teach these new tasks and the more verbal instructions I used the more resistant/distant the students became. I noticed that gestural prompts (pointing when needed) and physical demonstrations were most effective to teach the task. Sometimes a short verbal prompt/with a gestural prompt, such as “put this here” was also effective, but lengthy verbal explanations got me no where. I also started tying real life experiences to what I was teaching. My students seemed to thrive on hands-on/real-life activities with a clear ending. Examples included putting items away, sweeping up an area, or delivering an item. Below is one of my activities, called Learning to Read and Making Connections. This is a two part activity. The first part is a reading task. Many students with language/communication difficulties have trouble breaking words up into their individual sounds and blending sounds together to read words. However, they often have strong visual memories and learn better through visual memorization, than they do through learning the phonetic components of a word. 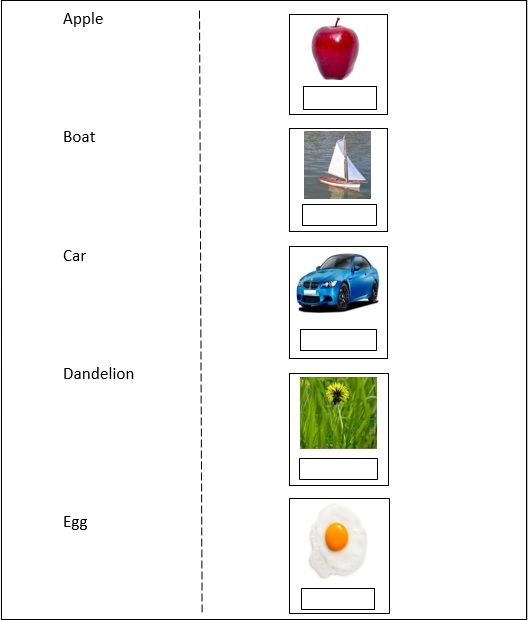 So in the reading task below, students learn to connect a word to an image or object. The task can be used again and again to allow for plenty of repetition, practice, and eventually memorization of the words. Even if the student cannot say the word, they can learn to connect the printed word to the real-life object. The second part of the activity helps students connect the words/objects they have learned to related items, in order to help them create a deeper meaning of the object. They are also encouraged to participate in a real experience that utilizes the items they have learned about. Check out Learning to Read and Making Connections Parts 1 and 2, below in a downloadable Word Document. Feel free to change them around to match your students’ levels and interests. Instructions: Cut the paper in half at the perforate line. Cut out the words. Ask the student put each word under the corresponding image. Optional: Laminate the words and laminate the right side of the paper (this is beneficial if you want to use the activity over and over again). Put sticky velcro dots on the back of the words and in each box below each image (this is so the words stay in their spot and don’t slide around). You can usually get materials laminated in a school building or office supply store. You can also purchase your own laminator online or at an office supply store . You can get Velcro dots at any art supply store or purchase them online . Instructions: Cut the paper in half at the perforated line. Cut out all the images on the left to make them individual pictures. Leave the right half in tact. 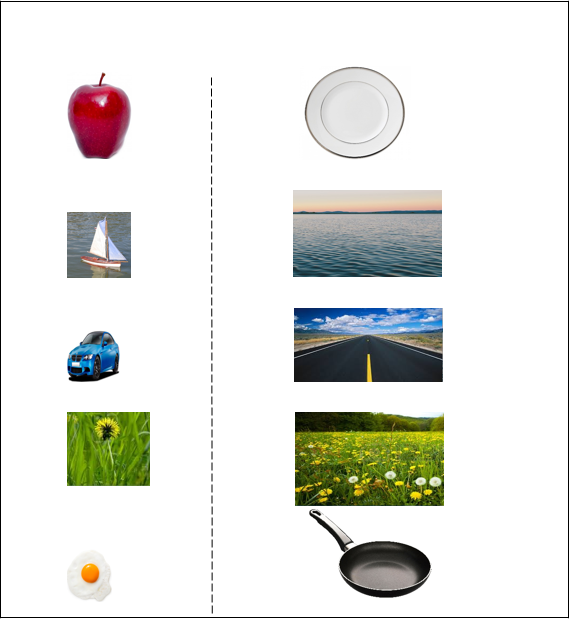 Ask the student to put the correct image on the corresponding picture (e.g., apple on the plate, car on the road). You can laminate and Velcro this activity as well, the same way I mentioned above. After putting an image on its corresponding picture (e.g., apple on plate), do a real life activity to connect the visual to a realistic situation. For example, after putting the picture of the apple on the plate, get a real apple, put it on a plate (you can each do this and enjoy an apple together). As another example, crack an egg in a frying pan and cook it together. For each hands on activity, have the student/child participate in the steps as much as possible, providing guidance and assistance as needed. Thank you for visiting educationandbehavior.com! We are a free resource for parents, caregivers, educators, and counselors! Browse our topics/categories from the menu button at the top left of the page! Receive our updates on Facebook! If you found this helpful, please share it!